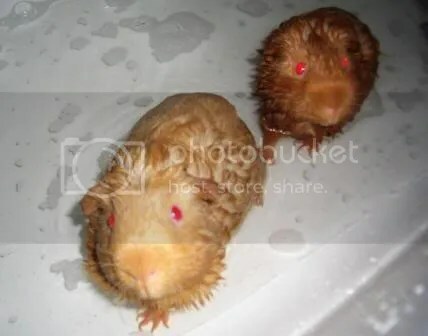 Last time mummy bathed us it was very scary and I didnt like it and I jumped out of the basin and ran round behind some cups and plates on the side of the sink. Mummy had to rescue me from behind the cake tin. This time she took us upstairs to another nice warm light room. She had put some warm water in a huge white tub called a bath. It was shallow at the end she put us in, but when we went and explored the water got deeper and deeper so we were nearly swimming! It was quite fun at the shallow end where we were barely paddling – I did try to jump out but my back feet slid away, so I decided to enjoy paddling and swimming instead. Mummy gently splashed the water over us with her hand until we were wet all over! Then she put some stuff out of a bottle called “Just for Boars” on our necks and started working it in and ruffling up our hair and getting us all soapy. I started to really enjoy this especially under my tummy and started purring away like mad! Then came the fun bit of getting the soap rinsed off – this took some time. Mummy first tried using a scary snake thing that spouted water ever so fiercely, but she could see we didnt like it, although we were beginning to realise it wasnt going to hurt us when she changed to using a plastic cup and pouring the water over us more gently. 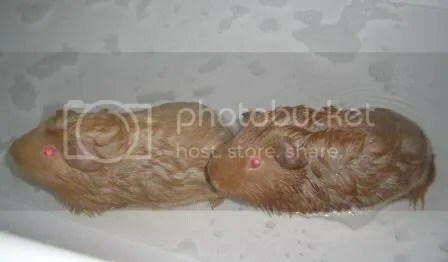 When she thought we were clean of the soap she took Fred out and after a few minutes she took me out as well. She mopped me with a towel to get rid of the worst of the wet, then wrapped me in in a warm dry towel which was lovely. 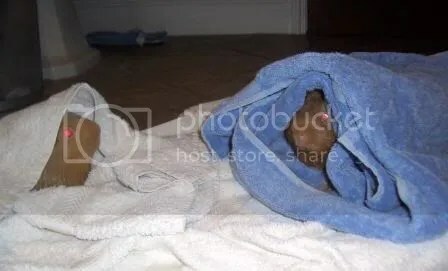 I could see Fred poking his head out of his towel too. She left us there for a few minutes and I could hear her moving about, then she took us one at a time downstairs, where she gave us a good rub, then trimmed our toenails. I usually dont like that much but I was quite happy to sit in the towel and give her a foot at a time, it was much nicer than other times she’s done that. The nails were much easier to cut too. Then she put some lovely smooth cream which she said was Gorgeous Guineas footbalm on my feet, wrapped me in a dry part of the towel and put me on the sofa while she did Fred. After that she gave us a good rub each to get us dry. 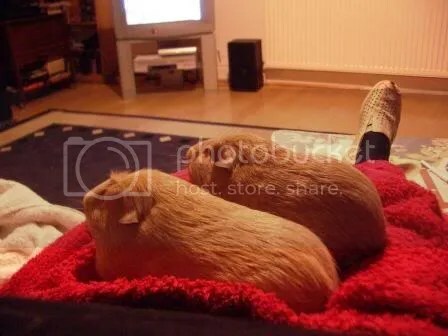 After about an hour we were dry enough to brush, then we sat on her lap watching a film before we went back in our nice clean cage. First published on GPRWA 02/01/2009.